Toddler Programs for Growth & Learning! Your toddler is at an age of incredible development and learning. A toddler is a young child between the ages of one and three. Children at the toddler stage are quickly gaining their ability to understand and use words. When you are in need of daycare for your toddler, it is essential to find a place that has high-quality care to help your toddler along in his or her development. Toddlers are also gaining skills in physical coordination, such as kicking a ball, climbing stairs and scribbling with a crayon. You will also see your toddler start to assert his or her own opinions and personality by saying “no!” Of course, all children go through different rates of development, so it is important for parents not to stress too much about specific milestones, as long as their children are happy and healthy. You may think that a toddler daycare wouldn’t have a set schedule but they do. Although they may not be aware of the routine, children are provided a full slate of activities filled with music, games, lunchtime, and storytelling. This also benefits parents who have to worry less that their child’s behavior will be spontaneous at the end of the day due to a lack of routine. A high-quality daycare should provide extensive interaction with care providers and activities that engage your toddler and boost their overall development. Unlike young children that don’t go to preschool, toddlers who are enrolled in a daycare or toddler program get the extra benefit of being around their peers all day. Parents can rest assured their young child will receive necessary interaction in a structured and safe environment, as well as an opportunity to see adults as mentors and authority figures at an early age. It’s true, young children who attend daycare find it easier to adjust to formal schooling later on. The kids are already used to a structured school environment with rules they must abide by and teachers they must listen to. As your toddler grows, there are many activities they can do along the way to help boost their development. These toddler activities often take popular games and focus them on strengthening your child’s skills. Adding these simple games to your toddler’s playtime help them develop physically, cognitively, and emotionally, all while having fun. This popular game can be played anywhere, and can help improve your child’s cognitive skills. Give your toddler a color, shape, or object to hunt down and bring back to you. As your child searches for an item that matches the description, it will test their memory and knowledge. This toddler activity can also give you the opportunity to teach them new words. Creating an obstacle course with pillows, blankets, and other objects in your own home can help your child exercise their imagination and growing muscles. After arranging the room, have your child try to get from one end to the other while jumping over, crawling under, and stepping from pillow to pillow. As your child thinks of how they are going to navigate the obstacles, this game gives them the physical activity they need to stay healthy. The simple game of charades can be a powerful tool for encouraging your toddler’s creativity, cognitive skills, and even emotional awareness. Have your child act out different animals and actions, and then try to guess what they are representing. Asking your child to act out feelings, like happy and sad, can help them begin to recognize their own and other’s emotions. 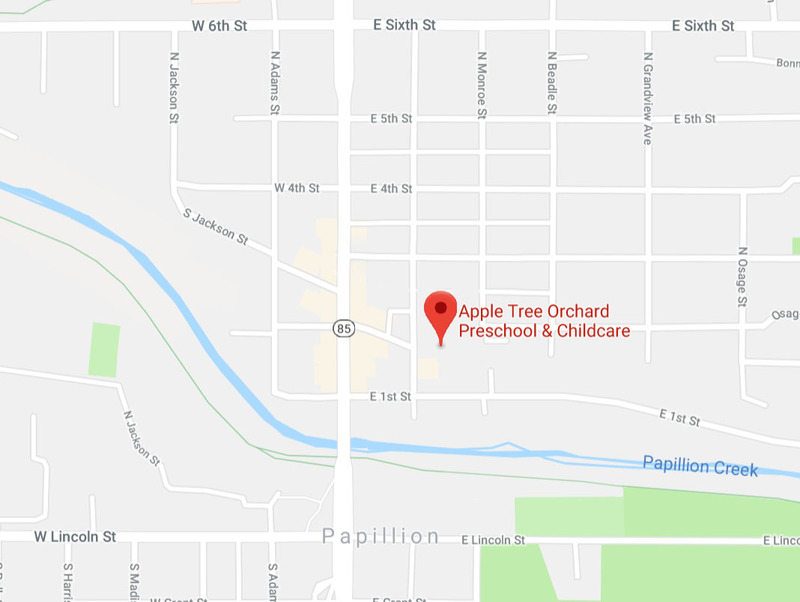 At Apple Tree Orchard, we strive to provide the best care possible for your toddler. We offer toddler daycare services that will give you peace of mind knowing your child is in good hands. Call us in Papillion at (402) 827-7537 or Contact Us Online today to learn more about our daycare and preschool.